L-Carnitine Formula is a balanced formulation comprising L-Carnitine Tartrate and Acetyl-L-Carnitine. It is designed to increase energy production and reduce post-exercise muscle stress. Carnitine is a completely natural substance which is present in all animals and some plants. It plays a key role in transporting long-chain fatty acids to the mitochondria, the small powerhouses found in every cell which enable energy to be produced in the form of adenosine triphosphate (ATP). The body therefore needs carnitine in order to function properly, particularly the muscles which need a constant supply of ‘fuel’. The human body synthesises the carnitine it needs from lysine and methionine, two amino acids found in food. Insufficient dietary intake of these two amino acids can therefore lead indirectly to a deficiency in carnitine, which results in slow growth and a fall in carnitine levels in the blood and skeletal muscle. The best dietary sources are foods of animal origin such as mutton (210 mg/kg), beef (60mg/kg), pork (27 mg/kg), fish (5 mg/kg) and milk (2 mg/kg). It is found in some fruit and vegetables but at very low levels (0-5 mg/kg). In general, dietary intake varies from 15 mg to 300 mg a day, depending on diet. Who is L-Carnitine Formula aimed at? L-Carnitine Formula is primarily for anyone looking to reduce their fat mass while improving sports performance and post-exercise recovery time. As a result of its ability to direct fats towards muscle tissue, L-Carnitine helps increase energy supply and thus helps improve muscular endurance. It also does this by maintaining glycogen stores and reducing production of lactic acid. In particular, studies have shown that carnitine supplementation is able to reduce post-exercise muscle stress. those keen to increase their energy levels naturally. What happens to carnitine after ingestion? 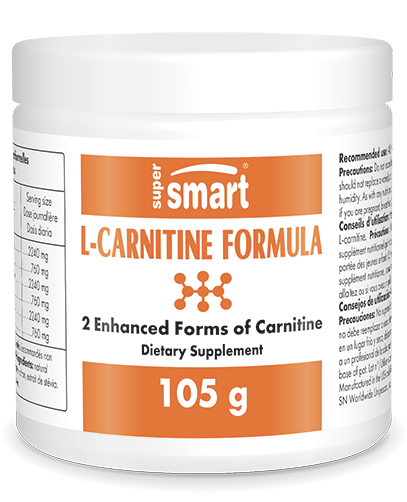 Once ingested, L-carnitine is absorbed in the small intestine via specific transporters and by passive diffusion. L-carnitine’s bioavailability varies between 50% and 85% depending on the amount of dietary carnitine consumed: the higher the intake, the lower the availability. When should you take L-Carnitine Formula? L-Carnitine Formula is comprised of L-carnitine which is water-soluble, and acetyl-L-carnitine which is fat-soluble and is able to cross the blood-brain barrier. It should be taken with food, ideally after exercising when the body’s carbohydrate reserves are at their lowest (especially glycogen) and when insulin production peaks, as this is associated with improved absorption of carnitine in tissues. Other ingredients: natural lemon flavour, stevia extract.